We’re thrilled the new flavors in our product line strike a chord with adults. It’s a fantastic evolution of the brand that adults want a clear and refreshing on-the-go drink that does double duty as a bright zero-calorie mixer for cocktails. “We’re thrilled the new flavors in our product line strike a chord with adults. As a busy and health-conscious mom, my first goal was to create a trusted, healthy water brand for kids. 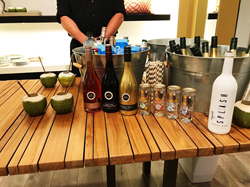 It’s a fantastic evolution of the brand that adults want a clear and refreshing on-the-go drink that does double duty as a bright zero-calorie mixer for cocktails" said founder and CEO Heather McDowell. Please refer to the following link for specific product information and images: Tickle Water Photo Album. For more information about Tickle Water, please visit our site, and follow us on Instagram and Facebook. Tickle Water is a premium sparkling water company dedicated to providing honest and clean hydration. Tickle Water is the first sparkling water in the market created specifically for children, yet enjoyed by all ages, with bright and vibrant flavors and a recyclable transparent PET can, making it the perfect beverage for any occasion. Every can of Tickle Water is made with premium triple-filtered sparkling water and natural flavors without artificial ingredients, sugar, or preservatives.